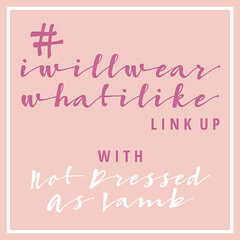 I guess it had to happen eventually: Pantone’s Colour of the Year (Rose Quartz and Serenity) is the theme for this week’s #iwillwearwhatilike link up. I chose these colours as part of my blog’s new design and colour palette just a few days before Pantone announced the Colour of the Year for 2016 (honestly!) and it’s no surprise that I’ve been drawn to them where my wardrobe’s concerned as well. The star of the show is undoubtedly this blue check coat by Ganni at Asos – another believable fact but this coat is now reduced from £320 to just £54(!! ), and there’s a few sizes left (bargain of the century methinks). Like the crazy-cheap orange animal print coat I wore on the blog on Saturday, it seems that an incredibly mild December has meant retailers haven’t sold much outerwear this season, so coats are all severely reduced. Great news for statement coat-loving gals like me – this one’s only gone and bought =ahem= four coats in the sale…! 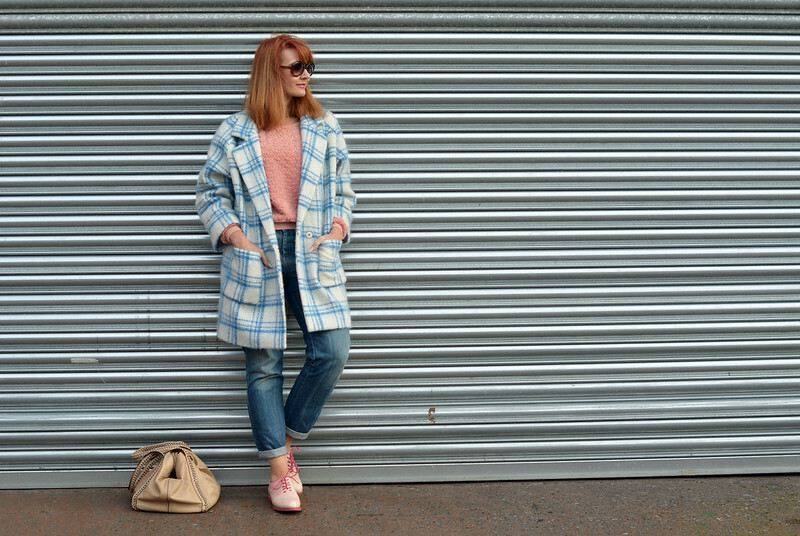 So the blue in the checks of this coat are the perfect match for Serenity, and the boyfriend jeans aren’t far off either. The Rose Quartz comes in the shape of my fluffy pink sweater (last worn here and here) and the old-but-trusty pink brogues – I’ve had them so long I’m wondering if they’ll ever go out of style. I have at least 10+ pairs of brogues and I’ll be gutted if one day I realise they just look a bit old fashioned! A quick mention for the cutest earrings I got from Asos: Mixed metal triangle earrings, which I think are going to be my new go-with-everything pair. I was also originally going to wear my bright blue Marc Jacobs sunglasses, but thought better of it and decided they might be too matchy-matchy. Neutral brown sunnies and my taupe leather bag let the pink and blue “sing” a little more – I know some people think this year’s Pantone colours are a bit sickly but I happen to love them. Easiest colours to wear (for me) ever…! My favourite DAVID BOWIE tribute outfits from last week’s link up (well done all those ladies who joined in with this, I thought I’d struggle to find anyone to feature)! P.S. Last chance to vote for me in the UK Blog Awards – closes today at 9pm UK time (4pm EST), thank you!! That coat could not be anymore perfect – not to mention the color of your sweater is perfect! Great Post! I am doing a post on the colors of the year tomorrow as well. Love how they just look so great together. Catherine, I had been noticing you becoming the epitome of the rose quartz and serenity colors of the year–oh maybe back since your trip to Greece. Maybe Pantone chose it because of you. It is possible you know! These colors are Catherine's colors! Was it the new blog theme that made you switch your color scheme? Time? I'm just curious….At what point is it time to switch up our blog themes? I think mine is almost three years old or so. I am definitely ready to move on to something else. Huge endeavor though right. Oh, so many things to get better at with blogging! Gives one drive doesn't it! Thank you for offering this link up to your readers AND in turn coming on over to the Kremb de la Kremb Style Stories Link Up. I love seeing you there. And I love seeing you in rose quartz and blue. So pretty!! Hi Ann, thanks so much my lovely! I wanted to get my blog completely redesigned anyway, so it was the right time to change the colours and fonts and my avatar as well (of course I'd chopped off my hair to my new bob and the old avatar just didn't look like me anymore). It was after coming back from Santorini and looking at all the pinks, peaches and blues in my Instagram feed that I had the eureka moment of what my new palette should be, so once I knew that, the rest just followed. You look fantastic in pastels, and I love your coat. I'm more of a bold colour person at this moment but I'm always changing. Thanks for the linkup – I'm a bit late. I might put an Instagram link too. This outfit is wonderful! And the shoes are out of this world! Where can I find them in pink? Plus it was my pleasure to feature your Bowie look – I was hoping someone would do the Thin White Duke…! 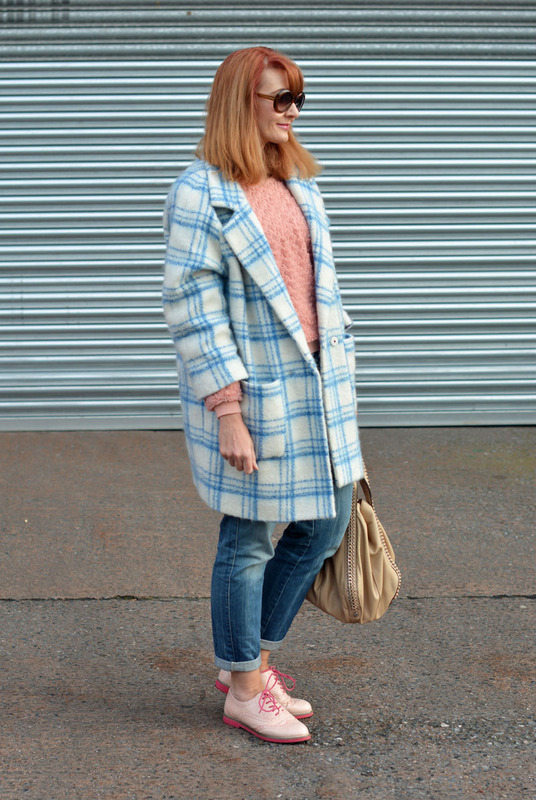 An oversized (bargaintastic) coat in a gorgeous colour/texture combination. Those perfect little earrings, Super-cheap and don't look it. I am in need of some non-skinny non-flared jeans (I am so bored of the old styles). Boyfriend (or girlfriend) look great, but it is all about the feel and the fit. These look like they are soft and comfortable. A winning (early) Spring look! P.S. Thank you for inspiring me with more pastels…..I might be coming round to them! Great use of the colors of the year. 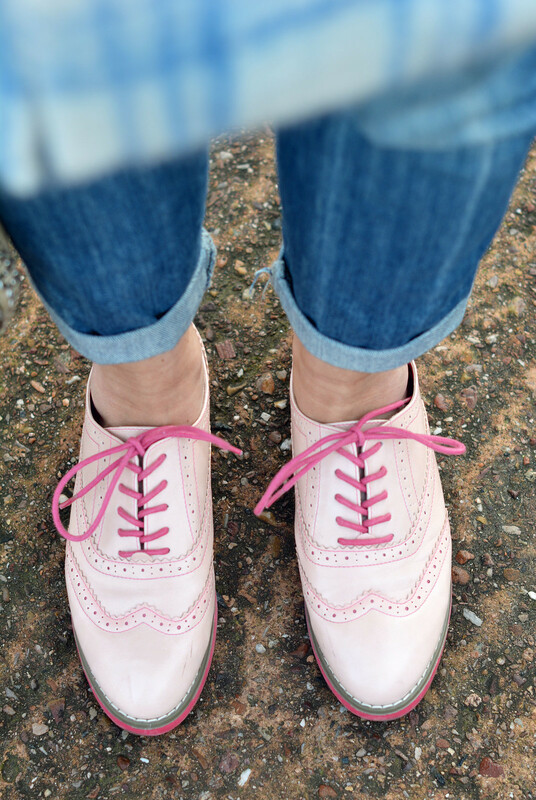 I love those oxfords! Thank you for hosting and hope you are having a fab week! I must confess. Waking up and making the cut (so to speak) is always such a thrill, Catherine, it's like winning an award and you have utterly made my day!!! Really, really (pause to gush). Thank you thank you for choosing my Bowie outfit. It was/is very special for me because (a) it's Bowie and (b) Bowie is no more. Much love. I am loving these colours! perfect for me. I love how you have styled the colours,which reminds me not to be so monochromatic.A bad habit of mine! Isn't it just the BEST when things you love are seriously reduced, Anna…?!!! And yes I know all about your love of brogues – you're as bad as me (can you beat me with number of pairs? I think I have about 13)! Fabulous pink and blue together. In love with your hair. aww thank you Sacramento – I still love my shorter hair too…!!! First of all, your brogues are to die for! And your coat is so much fun. I would wear any colour so this year's colours won't be a challenge for me. The Pantone 2016 colors look wonderful on you! However, you won't be seeing them on me. I look terrible in pastels. They wash me out and make me look old. Love this combo, your post just reminded me that denim is the color of blue. I guess I have to edit my post now…LOL! I absolutely love these colors, and for once, Pantone picked colors I like and would wear. Your outfit is amazing! Love the coat and shoes. Love how you styled them, coincidentally, "how to wear the pantone colors of 2016 according to your skin tone" is the latest post on my blog. Aww Cheryl thank you! Those shoes are *always* popular whenever I wear them…!! What a fabulous coat at such a fabulous price! Lucky you. You made a perfect outfit with it. Thank you Greetje… I think you could probably tell how pleased I was with my bargain buy!! A challenge for me but perfect for you, Catherine!! I probably have to wait for spring before I'll jump on the Pantone colour bandwagon myself 😉 Then most likely I will wear them separately paired with neutrals. Oooh! Those brogues are FABULOUS! I wasn't blown away by the colours when it was first announce but they're growing on me. I'm always a bit iffy about light pinks – bit insipid for me and not always a great colour for me to wear (unlike you, for whom it was totally meant!) but I've started to think about pairing it with other deeper colours like grape, teal and grey it works really well. Lovely to see those brogues again – they'll never go out of style! Where do you store all your coats, Catherine???? Serious question! Is your wardrobe like the Tardis? I think the colours have grown on a lot of people, Jacqueline – though I was in love the second I saw them (no surprise there)!! I love the idea of pairing them with grape and teal though! Er, as for the coats: They're not kept in my wardrobes… Either of them! (Yes, I have one in our room and one in the spare room, oops.) Both wardrobes are too full for winter coats, so I have a rail I put up just in the winter for big coats. In the summer they all get vacuum packed away. If only I had another wardrobe – or rather, somewhere to PUT another wardrobe!! I'm a bit of a nightmare as you can imagine…!! What a beautiful coat! I find these colours a bit tricky to wear as anything so pale will wash me out completely. But I think they would look better in accessories, I even have a blush pink tote bag. 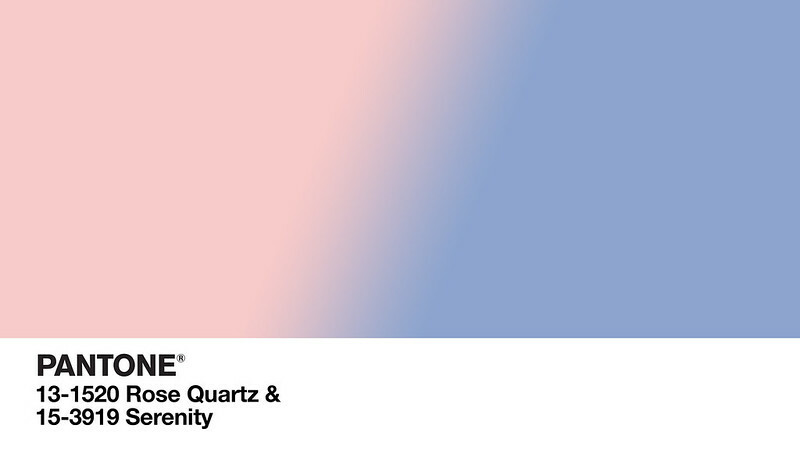 I know I've said this before, but rose quartz and serenity are your colors! What a great coat! And, yes, I am a bit jealous of the great coats you got (mainly because it just doesn't get cold enough around here to justify a "coat collection"). I love the shoes, too. I have been adding light pinks as accessories, but I don't have shoes (yet)! this year's Christmas tree around this palette! Thank you for hosting us every week – it's always a joy! Aww bless you, Andrea – thank you! Pink and Blue will never do – rubbish! They do just dandyly! I'm loving this year's choice. They're really adult versions of the colours that make for some great outfits and yours is certainly one. I'm so happy for your mild winter bonus in the form of coats. Have loved both of them you have featured this week. Thanks so much for hosting!